Once again, Heaven Gifts was super speedy in delivering the goods. I was notified that I had been selected on a Wednesday, and I received the device via DHL by the following Monday. In all my dealings with Heaven Gifts, I have been very impressed with the quality of service and the speed of shipping. Of course, this was for a review and the service and shipping might be a little different for consumers. I was wrong. This device is very nice. It is 19 mm in diameter, and 153 mm tall with the included mouthpiece. There are four pieces to the device (not counting the spare coils, charging cable, box, or manual. 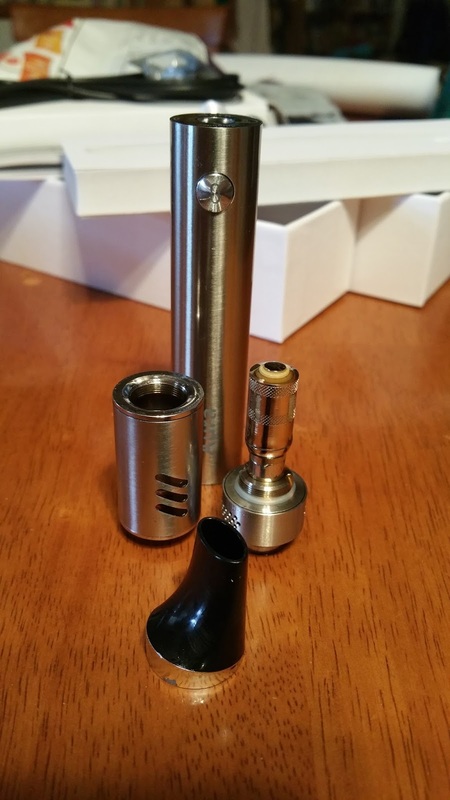 There is a mouthpiece, a tank, a coil and a battery body. The device, all assembled, weighs in at a very light 104 grams or 3.7 ounces. The battery, according to the manual, is a 2000 mAh batttery. It's a straight voltage device with no adjustments, so we're getting a nominal 3.7 volts out of it. It's good for several hours of vaping. The kit comes in a nice box with a manual, charging cable, extra mouthpiece, extra o-rings, and an extra coil (there are two coils: one .5 Ohm coil [they claim it delivers between 21 and 35 watts] and one .33 ohm coil [the claim it delivers between 33 and 53 watts]). There is no wall wart. A wide bore, offset, oval drip tip sets over the entire top of the device. At the base of the tip, there is a slanted chrome ring. Under the mouthpiece, there are two rings. One ring slides inside a 510 compatible tube, and the other, thicker ring nests on the outside of the 510 drip tip connector. Vapeonly claims that making the mouthpiece offset prevents spitback. I think they might be right. The oval, offset mouthpiece is quite comfortable and I've had very little spitback. The kit comes with a second wide bore stainless centered mouthpiece, but, unfortunately, my second mouthpiece was in a rather unfinished state. The mouthpiece was plugged... talk about restrictive airflow? How about NO airflow? Beneath the mouthpiece, there is an airflow adjustment ring reminiscent of the band on the UD Bellus. There are 22 small holes on each side, so it's very easy to cut the airflow down to something comfortable for a mouth-to-lung draw, and just as easy to open it all the way up for a slightly restricted direct-to-lung. Beneath the airflow collar is the tank. It is a metal clad glass tank with three slash windows on either side. There is NO chimney! Filling the tank is as easy as pouring up to 3 ml of e-liquid into the tank up to the top of the slash windows. Yes, pouring. No worries about squeeze bottles or droppers. The coil and the chimney are attached to the airflow collar. The coil makes contact with a plate at the bottom of the cup-shaped tank. The tank is 510 threaded, so it can be used on other devices. The center pin does not protrude at all. DO NOT use on a hybrid top cap mech. Don't do it! Beneath the tank is the battery which, if the fire button were a back lit rectangle instead of an oval with a lit power symbol in the middle, could easily be mistaken for a Joyetech eGo ONE XL battery. Other differences include the placement of the micro USB port towards the top, elimination of grooves for 510 airflow in the 510 connector, and, of course, logos. This one says Aura on one side (bear the bottom of the battery body under the fire button) and Vapeonly on the other side (just beneath the micro USB port). There is a single vent hole on the base of the battery, and no certifications engraved anywhere on the device, but that might change as my unit is a beta. As with any other subohm tank, we are instructed to prime the coil, install it, and let it soak for a minute to prevent burning the wicking which is cotton. I can find no discussion of the coil composition, but I feel relatively certain it is Kanthal. Once primed and installed, the device is powered on by clicking the fire button five times within two seconds. The power indicator set into the fire button will blink white if there is enough charge to proceed with vaping. It will flash red if it needs to be recharged. Interestingly, the manual specifies that charging is only to take place with a micro USB cable and not with a 510 connector. Once plugged in, the power indicator will turn red for a bit, then the device will enter standby mode as it is charging. The manual makes no mention of passthrough, and although I was able to vape on it while charging, I would not recommend it. It appears to take a little over an hour to charge. I have no whiz bang gadgetry, but I suspect it takes up to a 1 amp charge. Low resistance - the light will "double flash" white 5 times and go into standby mode if the coil reads under .2 Ohms. Oddly enough, they recommend a coil above .5 Ohms, but supply a .33 Ohm coil. Open circuit - the white light will flash 10 times and the unit will enter standby mode. Low voltage - the white and red lights will alternate, flashing 5 times. 10 second cutoff - the white light will "triple flash" 5 times and enter into standby mode. In use, it's simple! Fill 'er up, press the button, inhale, release the button, repeat until it don't vape no more, and then plug it in. Second mouthpiece on my kit was a plug! A little work in the QC department would go a long way. No higher resistance coils for true beginners available - I would like to see a 1 Ohm coil for beginners not yet wanting the subohm experience. I did experience just a hint of flooding when refilling the tank and setting the coil back in. After the first few pulls, though, the flooding and gurgling subsided and did not reappear until I filled the tank again. I've run through around 6 tanks (18 ml or so) on the .33 coil. I have yet to break out the .5 coil*. Form - 10/10 - Dead simple to use, to fill, to charge, and very comfortable. Function - 10/10 - Again, dead simple. No muss, no fuss, no leaks. 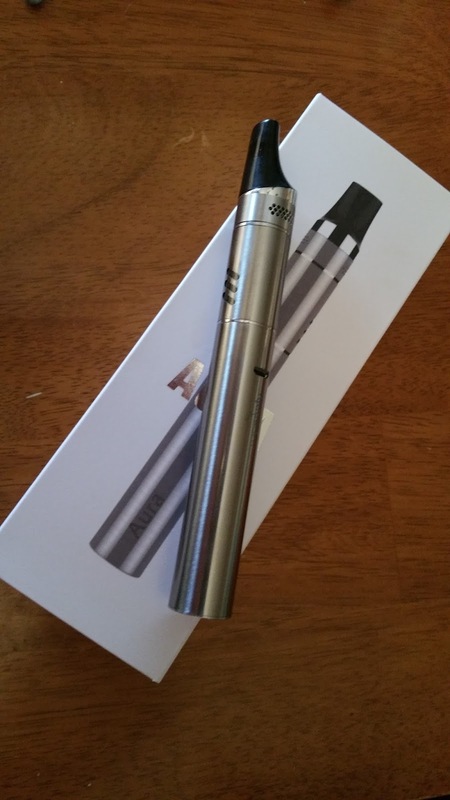 Just a great vape! I have yet to see this device available anywhere, so I cannot say whether or not I would purchase it if I lost or destroyed the one I have. However, if this comes in around $35 (likely, I think, based on the sub $30 selling price I have seen on the Vapeonly Aura Mini), I would certainly make sure I had one on hand and another to give away to a smoker wanting to make the switch. Can I recommend it? Absolutely! It's a highly functional, easy to use subohm starter.